MOSUL, Iraq — Iraqi forces pressed forward with an offensive against jihadist-held areas of Mosul as the United Nations warned of grave danger to civilians in the final stages of the battle. More than seven months into the massive operation to recapture Mosul from the Islamic State group, Iraqi forces have retaken the city’s east and large parts of its western side, but the jihadists are putting up tough resistance in areas they still hold. "Our units are continuing to advance... and entered Al-Saha al-Oula and Al-Zinjili and Al-Shifaa neighbourhoods and the Republican Hospital," said Joint Operations Command spokesman Yahya Rasool on Monday. IS was using "explosives-rigged vehicles and snipers and suicide bombers" to target Iraqi forces, he said. Meanwhile in Baghdad, a suicide bomber detonated an explosives-rigged vehicle overnight at a popular ice cream shop, killing at least eight people and wounding 30 others, security officials said early on Tuesday. The Islamic State group-linked Amaq propaganda agency said the suicide bomber targeted a "gathering of Shiites". IS considers members of Iraq’s Shiite Muslim majority to be heretics and frequently carries out attacks against them. The Joint Operations Command said on Monday that Iraqi aircraft had dropped leaflets over Mosul urging residents to leave IS-held areas -- the second time this has been done within the past week. This is the opposite of the strategy Iraqi forces employed in east Mosul, where they urged civilians to stay in their homes, and may encourage even more people to leave. "In the past several weeks, 160,000 civilians have fled, and our expectation is that, because of this order (from the government), we could be seeing a similar number of civilians flee in coming days," Lise Grande, the UN’s humanitarian coordinator in Iraq, said. "Altogether, since the start of Mosul, 760,000 civilians have left their homes, and we are looking at the possibility of another 200,000 civilians leaving," she said. Of the 760,000 civilians who have fled, some 150,000 have since returned home, leaving more than 600,000 currently displaced. "We are deeply concerned that right now, in the last final stages of the campaign to retake Mosul, that the civilians... in (IS) areas are probably at graver risk now than at any other stage of the campaign," said Grande. She said that the UN estimates there are between 180,000 and 200,000 civilians in jihadist-held areas of Mosul, the majority of them in the Old City area. 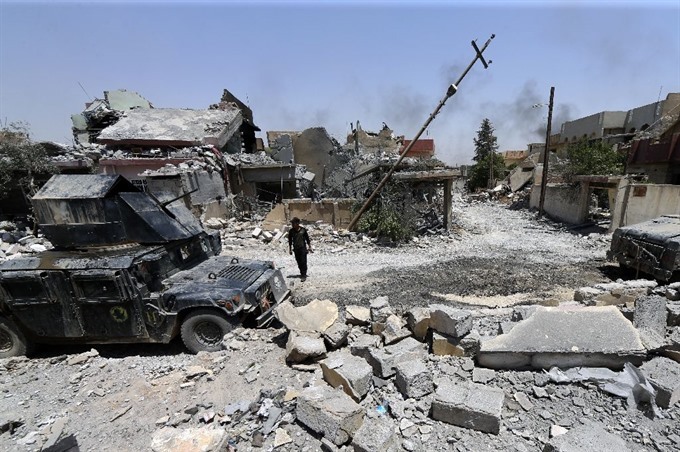 The area -- a warren of closely spaced buildings and narrow streets -- has posed a significant challenge to Iraqi forces, which have surrounded it with a large number of civilians trapped inside. "The Old City has been blockaded for a while, completely from the south and now our units are present on the north and west," Rasool said. The area’s eastern side is bordered by the Tigris River. According to information received by the UN from families who have managed to flee, conditions in IS-held Mosul are increasingly dire. "We understand that medicines are very scarce, that there are severe shortages of safe drinking water, that there are very limited stocks of food. We also are aware that families which try to escape are often targeted by snipers," Grande said. "You have an enclosed area, you have fighters which are determined to hold out, the civilians are in many ways trapped in that area, there haven’t been resupplies into the Old City for months," she said.